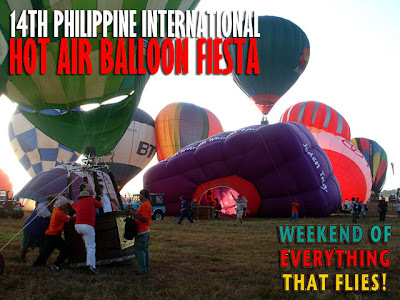 The 14th Philippine International Hot Air Balloon Fiesta will be held in Clark, Pampanga from February 12 to 15, 2009. Our Valentine's Day tour to the festival is fully-booked already but you can e-mail us at info@ivanhenares.com if you want to be included in the waiting list. Anyway, you can catch the hot air balloon flights from 5:30 to 7 a.m. daily during the festival. That means leaving Manila by 4 a.m. to be sure you make it on time. Take into consideration that the later you arrive, the harder to find parking. The schedule also mentions flights late in the afternoon but I'm not quite sure about this since the evenings are usually for the night glow event which you should not miss. Night glow is scheduled for Saturday, 6:45 to 7:30 p.m. The full schedule of the festival is here. Hi Ivan! Any recommendations on where to stay in Clark? Sana somewhere not very expensive. Thanks in advance! But the bad part is the DOT website has been tagged as "dangerous to your computer" which is stupid. They have all these international promotional junkets but the website, which is a very important international marketing tool, is pathetic. by the way, i love reading your entries :) it's part of my daily routine! more power!